Take 2:Remember Alejandro and Nikhil? 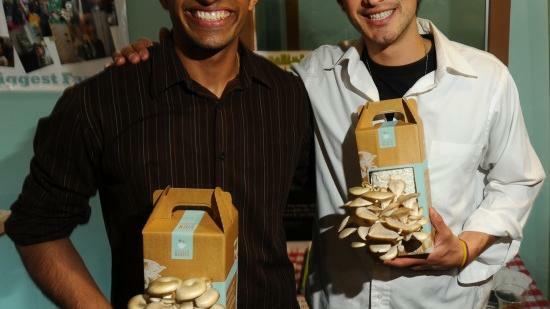 The two MBA grads from UC Berkeley who started , making kits that grow mushrooms out of recycled coffee grounds, all packaged in a sweet little cardboard box? The kit we used extensively in the ? The one that was given to me by three different people one Hanukkah because everyone thought it was just soooo up my alley? Well, they’re at it again. This time they’re tackling aquaponics: Growing edible plants and fish together in a self-contained system. How it works: Fish waste becomes fertilizer for the plants, and the plants filter the water for the fish. Check it out– just reached their goal and they hope to have products on shelves by the spring. Go! Watch the video! These two are just brilliant. I want one! Or three.